She Writes Press, 9781938314223, 228pp. Hedgebrook is a literary nonprofit that supports the work of visionary women writers whose stories and ideas shape our culture now and for generations to come. Founded in 1988 by visionary philanthropist Nancy Nordhoff and writer Sheryl Feldman, Hedgebrook hosts a global community of writers through residencies and programs exclusively dedicated to supporting the creative process of women writers. Each evening, Hedgebrook residents gather in the farmhouse kitchen to share a home-cooked meal, their work, their process, and their stories. Meals at Hedgebrook are lovingly prepared using ingredients from Hedgebrook's own organic garden. The land at Hedgebrook nourishes the writers' bodies, as well as their spirits, through our unique approach to radical hospitality. 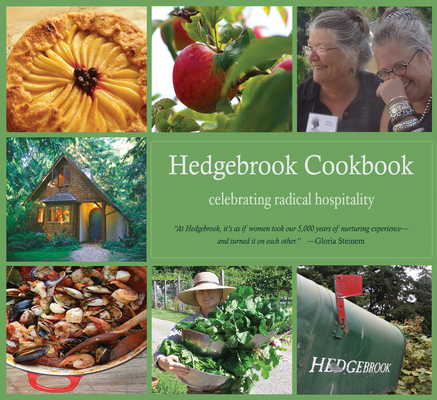 It is in this spirit that Hedgebrook created the Hedgebrook Cookbook. Recipes from our kitchen and writing from our alumnae community bring the essence of radical hospitality from our farmhouse table to yours. Includes contributions by: Gloria Steinem, Ruth Ozeki, Carolyn Forch , Valerie Easton, Erica Bauermeister, Ellen McLaughlin, Rahna Reiko Rizzuto, Ruth Forman, Dorothy Allison, Gail Tsukiyama, Claire Dederer, Jane Hamilton, Nassim Assefi, Samantha Thornhill, Thao Nguyen, Karen Joy Fowler, Annie Rachel Lanzillotto, and Monique Truong. Denise Barr lives on Whidbey Island with her husband and their many inspiring animals. She has always been involved in the arts community and treasures the creative, nurturing environment of the Hedgebrook kitchen. Denise believes that preparing a meal is the gift she has to pass on. What she most loves about Hedgebrook is the way in which everyone brings something wonderful to the table. Julie Rosten is proud to be part of a community of dreamers and strivers who seek something from life that was beautiful and true. Her love for cooking grew from her love of having family around the dinner table, to enjoy and share meals that strengthen the bonds that make life meaningful. At Hedgebrook, she showcases her own art form of food preparation and presentation.